Beat Detection iExpressions can be applied to properties which represent the audio amplitude of some music (i.e. properties which you created with the function 'convert audio into keyframes' of the keyframe assistent). They can detect the beats in the music such that you can animate various properties according to the music. The beat detectors just recognize the beat and don't do any animation, yet. You can animate properties using other iExpressions (like the 'Change on Beat 1D') which are then linked to the beat detector. This setup allows to animate several properties according to the same beat. 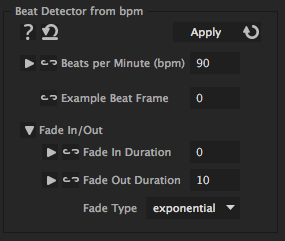 To use the 'Beat Detector from bpm', you need to know the beats per minute (bpm) of the music. The bpm can also be determined with the mamoworld tool Beat Assistant. Then you simply specify one sample frame where a beat occurs and the iExpression generates a regular pattern of beat signals according to the BPM. specifies one example frame, at which the beat occurs. The iExpression tries to detect all other occurences of the beat automatically. determines the number of frames over which the beat is faded in. If this is set to 0, the iExpression abruptly jumps on each beat from 0 to 100. If it is set to 10, the value starts already 10 frames earlier to slowly increase from 0 to 100.
determines the number of frames over which the beat is faded out. If this is set to 0, the iExpression abruptly jumps after each beat from 100 to 0. If it is set to 10, the value slowley decreases over 10 frames from 100 to 0.
determines whether the beat signal fades in or out in a linear or exponential fashion.